Can technique really make big enough difference to effect the final result? There are already excellent questions and answers here regarding specific measuring issues Cup measurements: shake or scrape? but I'm looking more for more general "how to measure" advice. Only worry about highly accurate measurement when it matters. This is generally when two ingredients or aspects of a recipe must be held in a close ratio to be successful. This occurs more normally in baking than in savory cooking (except for modernist or molecular methods, where accuracy is extremely important). The classic example is balancing the amount of baking soda and lemon juice in a recipe, so there is enough acid for the baking soda to react with and provide good leavening. In savory cooking, many ingredients just provide bulk, flavor, or texture, but are not reacting chemically with other ingredients in a significant way. In this case, you generally do not need highly accurate measurements. The goal when measuring ingredients is that you want to have a reproducible amount of the substance. The only true way to ensure this in the general case is to use an accurate scale, which measures by weight. The reason is that some foods are compressible, and can be squeezed or fluffed to different densities. The classic example is flour: depending on how you measure (sifting into a measuring cup and then leveling, to dip and sweep, for example), a single cup could weight as little as about 4 ounces at the low end to over 5 ounces at the high end. That is a variance of over 20%! For ingredients which are highly compressible, or whose density can change, measuring by weight is simply going to be more accurate, and more repeatable. 4.5 ounces of flour by weight is always, well, 4.5 ounces. Economical kitchen scales are available that measure digitally down to 1 gram (about 28th of an ounce). Switching from measuring primarily by volume to primarily by weight is somewhat scary. How much flour should there be in a cup? What does a cup of sugar weight? A quality cookbook for baked goods will give you ingredients by weight, or if not, in the front matter, will tell you what weight they are using for a standard up. Similarly, the quality websites for baked goods will tell you what weight they use for a standard "cup" of flour, or they will simply provide weight information as part of the recipe. If you don't have recipes specified by weight, and cannot find a specific conversion or standard cup size for your recipe source, here are some good values to get started for the most important ingredients. Web searches, such as Online Conversions can be very helpful in finding conversion factors. As a side benefit, once you are measuring by weight, you may actually find it is more convenient, and has less cleanup, as you can measure each item into a common bowl (pressing the tare or zero key each time). No more little pile of bowls and measuring spoons to wash! When is measuring by volume okay? Things that don't compress, and are not mixed with air are fine when measured by volume. The scientific reason is that their density is constant, so a given volume will always have the same weight. Spices are another exception. While measuring by weight is in fact preferred and more accurate (if you have a scale accurate to below the gram level), they don't usually participate in the chemistry of a recipe, and are adjusted to taste in any case. Therefore, the inherent inaccuracy of measuring them by volume is less troublesome. Salt is an unusual ingredient. Depending on how it is crystalized, it can have surprisingly different weights per volume. For this reason, if you can, measuring salt by weight is always more accurate. Still, it is often used in small quantities, and it is fairly in-compressible, so measuring by volume should be okay, as long as you always measure the same type of salt. Be aware that different salt brands and types have differently shaped granules, crystals, or flakes, some of which have air inclusions, so the weight to volume conversion depends on the particular type of salt. While all granulated table salts are fairly similar, kosher and specialty salts can weight as little as half as much per unit of volume in comparison, and can vary by brand. If you do measure by volume, use the right type of measuring tool. A measuring spoon or dry measuring cup is appropriate for, well, dry ingredients like sugar. To use it properly, overfill the bowl of the spoon or the well of the cup, and then sweep off with something straight (like a chopstick or the back of a knife) to make it level. Except for very small volumes like measuring vanilla extract, where measuring spoons are used (and some accuracy is sacrificed), for liquid measurements, use a liquid measuring cup, which typically is transparent and has graduations marked up the side. When you fill the measuring cup, you will notice that the liquid curls up or down at the edge of the cup. This curve, called the miniscus, is a result of how the surface tension of the liquid interacts with the material of the cup. For the most accurate measurement, you would read at the center of the miniscus, where it is level, not at the edge. The measuring tool you use should be about the same size as the amount you want to measure. It would be very hard to measure a teaspoon of vanilla correctly in a 10 gallon drum marked off in quarts. Similarly, measuring a gallon one half cup at a time is no fun, and an invitation to inaccuracy. 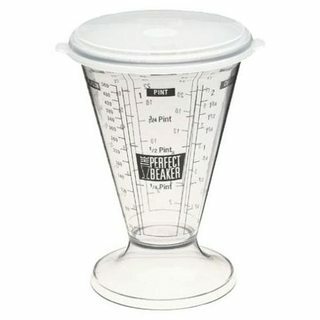 Measuring cups are available in many sizes, from shot glass sized (suitable for measuring teaspoons and tablespoons) to very large ones that can measure gallons. A home cook should probably have at least 1 cup, 2 cup, and 4 cup versions. is a nice tool, as it is very accurate a range of scales. Recipes are a code, telling you how to recreate the dish in their author's minds. Sometimes, the code is fairly crypic. Do you measure, for example, the nuts before or after chopping them? Well, if you are measuring be weight, it doesn't matter—just one more example weight is easier. One of the most important things we measure in the kitchen is temperature. It tells us when a steak is done, when butter is at the best plasticity to make croissants, and when milk is at an unsafe temperature, among many other things. Temperature is very tricky to measure because it is local. One part of a chicken thigh in a sautee pan can be much hotter than another. The most important factor in getting an appropriate temperature reading is choosing the right thermometer for the job. 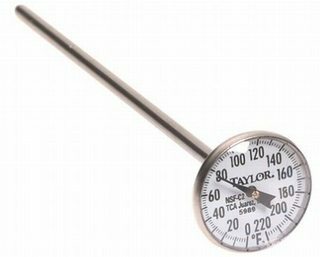 Instant read thermometers (the kind every chef and professional cook should have in their pocket): the generalist of the kitchen thermometer world. 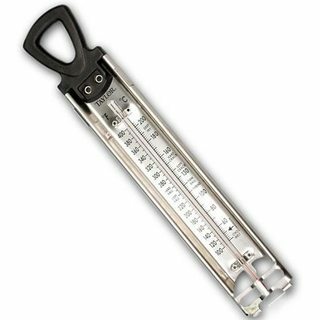 Useful for measuring almost any food temperature, except for sugar work. Every cook should have one of these. To use them properly, stick the probe into the center of the food item (if it is solid) or stir a liquid and then insert the probe. Weight for the temperature to stop changing rapdily, which could be 2-20 seconds depending on your model. Probe thermometer. These are convenience for roasts and items placed in the oven for a long period of time. Insert the probe into the thickest part of the meat, and set a temperature. The probe goes inside the oven, and the main unit sits outside. Most have an alarm that will go off when you reach a set temperature, making it very easy to target a particular temperature for doneness. 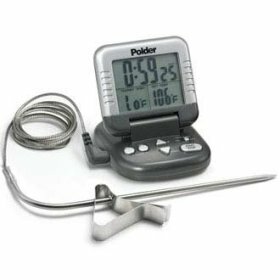 Probe thermometers can only check one spot on a roast or dish. You should then verify other spots with your instant read to confirm the dish is fully cooked everywhere (this is most important with poultry which is oddly shaped, and where you have a safety issue in terms of bringing it to temperature). Sugar or deep fry thermometer. These are often marketed separately, but they are the same type of thermometer, and are generally inter-changable for either use (although sugar thermometers may be more accurate). They clip to the side of your sugar pot or deep fry pot. They are accurate for temperatures in at least the 200 F to 400 F range, where deep frying and sugar work is done. Some instant read thermometers are accurate at these temperatures as well, but they should not be left immersed. Read your individual manual. This answer stresses the most accurate ways to measure. In some baking, and in molecular gastronomy applications, this matters. In practice, even in most baking, recipes are remarkably forgiving. 10% more or less vanilla, or 15% variance in the amount of eggs is not going to make or break a recipe at the scale used by home cooks. So use good practices, which will give you better consistency in your recipes, but don't stress out too much. Some things, like spices or vanilla extract, are just easier to measure by the spoon, even if a gram scale would be more accurate. That is okay. Accurate measurement in most cooking is generally about proportions and reproduction...whether you weigh or measure with cups and spoons, the answer is consistency. Use the same tools and processes over time and you will have success. That is the formula most cookbooks have used. Clearly, a scale is a more accurate way to measure ingredients that are impacted by variations in humidity, for example, but it isn't necessarily better than cups and spoons as long as you are consistent over time. Having said that, when I am using modernist ingredients (working with hydro colloids for example) I am typically working in percentages, which are much easier to calculate by weight. So a scale is required for accuracy. How to measure? Bottom line for me....if you want consistent results, use the same measurement process each time you follow a recipe. I weigh the ingredients on a scale. Then you know you have the exact same measurements every time. I always do this when I bake, even with most liquid ingredients, except for things like eggs. If I was doing it on a large enough scale, I would weigh my eggs as well to make sure I could duplicate it every time.